New Brunswick, N.J. – Research by Rutgers Cancer Institute of New Jersey investigators has identified novel functions of the superoxide dismutase 1 (SOD1) enzyme providing support that it could serve as a therapeutic target in the most common type of lung cancer. Results of the work are being presented as part of a poster session at the American Association for Cancer Research Annual Meeting being held later this week in Chicago. Lung cancer is the second-most diagnosed cancer and second-most cause of cancer death in the U.S. for both men and women, according to the American Cancer Society. Non-small cell lung cancer (NSCLC) is the most common type (84 percent). The five-year relative survival rate for lung cancer is 18 percent. The laboratory of X.F. 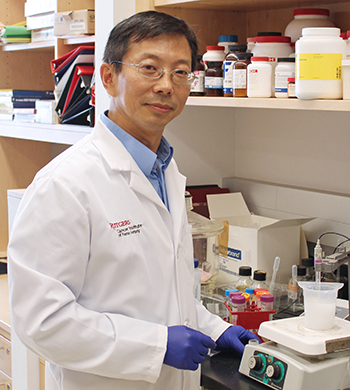 Steven Zheng, PhD, co-director of the Cancer Pharmacology Program at Rutgers Cancer Institute, has studied associations between NSCLC and the SOD1 enzyme. SOD1 is an enzyme that removes a specific radical byproduct created during the energy-producing process of cell metabolism. This ‘superoxide’ byproduct comes from a family of byproducts known as reactive oxygen species (ROS). These byproducts can modify fats, proteins and DNA in a chemical reaction called oxidation, causing these biological molecules to lose functions. Low levels of these byproducts can cause normal cells to become cancerous. At higher levels, cell death and damage to tissues and organs can occur. Recent work by the Zheng laboratory demonstrated the novel function of SOD1 as a transcription factor that helps remove ROS byproducts, thus regulating cell response to oxidative stress. In this current work, Zheng and colleagues used lung cancer laboratory models in which the SOD1 enzyme was genetically removed. With the absence of SOD1, investigators found the tumor burden to be reduced, thus suggesting SOD1 is required for tumor maintenance and survival. Also, using tumor-derived primary cancer cells from laboratory models, researchers show that SOD1 is critical for NSCLC cell proliferation and survival. Along with Zheng, the author team consists of Xiaowen Wang, Rutgers University School of Graduate Studies Biomedical Sciences; Justin Wong, Rutgers University School of Arts and Sciences; Holly Van Remmen, Oklahoma Medical Research Foundation; Jessie Yanxiang Guo, Rutgers Cancer Institute of New Jersey and Rutgers Robert Wood Johnson Medical School; and Eileen White, Rutgers Cancer Institute of New Jersey and Rutgers University School of Arts and Sciences. The study was supported by grants from the National Institutes of Health/National Cancer Institute (R01CA173519, R01CA166575 and R01CA123391). For patient appointments/inquiries please call 732-235-8515.